I'd just stepped outside into the 36 degree heat and humidity when my phone rang. It was my wife back in New Zealand where the weather was wet and cold. We had a quick chat about various things and then she told me our new cat Otis, described by the SPCA as “a handsome gentleman with a sense of adventure” seemed to be missing me. And had taken to tearing up the furniture. “Darling, I've really had enough of cats right now,” I said. 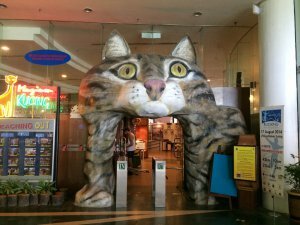 I was standing outside the Cat Museum near Kuching, the capital of Sarawak, and had just seen more cat statuary, posters, trinkets and artwork than in the many previous decades of my life. Kuching is close to the Malay word for cat, and it may have been there was an abundance of felines around this region along the edge of the Sarawak River. Another theory is the place was named for a particular fruit (mata kucing) which, according to some, looks like cats' eyes. Either way, attractive and sprawling Kuching – population around 500,000 although you'd never know it in the quaint central area – has embraced its cat association. 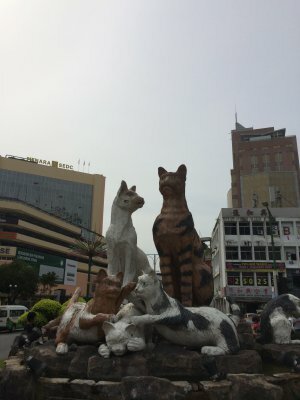 At various intersections there are plaster or cement statues of cats (some cute, some idiotically ugly) and the animals wander freely through open air restaurants, bars, cafes and shops. 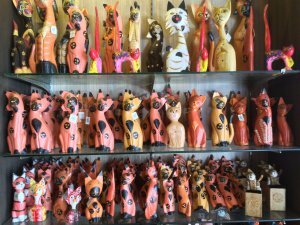 In many small stores there are shelves of cats carved from wood or moulded from plaster. Cats everywhere. And soooo cute. The crowning glory in this cat obsession however is the Kuching Cat Museum, located in a commanding building north of the river. This towering place on top of a hill is enormous and impressive . . . but when taxi drivers or tour guides point and say, “Cat Museum” that's a little misleading. The museum only occupies a corner of the ground floor of this municipal hall and office block, but they sure cram in a lot of cat stuff. 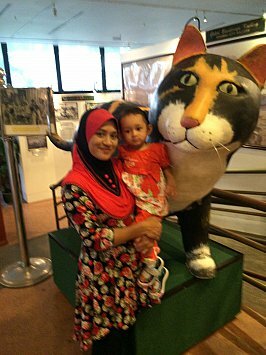 The Cat Museum was transferred to Sarawak on the north coast of Borneo from Kuala Lumpur on Peninsula Malaysia in 1988 and officially opened here five years later. Since then anything cat-related – and I do mean anything – seems to have found a place in it. The room of movie posters illustrates this at its most bizarre. Aside from a single word in the title, what's the connection between the films Cat on a Hot Tin Roof, Cat Ballou, Cat People, The Owl and the Pussycat, What's New Pussycat? and The Cat Burglar? And why would they have a poster here for the 80s pop band from Britain called Curiosity Killed the Cat? 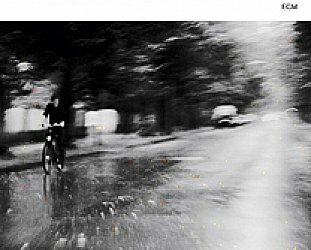 So, what did Albert Einstein, Winston Churchill, Henri Matisse, Ursula Andress, Albert Schweitzer and Bridget Bardot have in common? You guessed it, a love of cats. Of course there's still from a Bond film where Max Von Sydow as arch villain Ernst Blofeld is stroking his cat, which looks about as evil as him. But it does seem a stretch to have a passage from Charles Baudelaire's quoted at length in which he writes about caressing a woman: “Come my beautiful cat, on to my loving heart – pull back your claws and let me lose myself in your beautiful eyes – a medley of sapphire and agate”. Beautifully sensual writing, but less to do with a cat than the woman of his desires, I think. Get past the bizarre and indiscriminate inclusiveness of the museum and there are actually some interesting displays. I had no idea that for New Zealand's Stampex in 83 we had an edition of stamps with various breeds of cat on them. Or that stamp designers in Equatorial Guinea were so mad on moggies. Or that there were many Malay proverbs and analogies relating to cats. 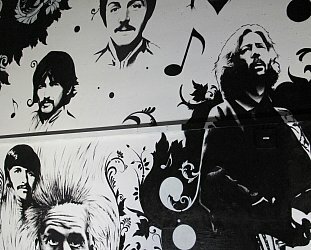 A whole wall of them, illustrated, in fact. For example, Harimau Beranti means a chained tiger, the most powerful and respected person in a team or group. There was an interesting but suspiciously modern sounding “old Iban folk tale” about a cat called Tom who was the first moggie in Kuching, having come over by boat from Singapore. It explained why Kuching cats have short tails. Tom was considered an import by an official so had his tail lopped off as “import duty”. That seemed a tall tale about short tails, to me. The museum has many interesting examples of various cats (the fish-headed cat?) stuffed and in display cases, but mostly there were images of cats in stone, wood, ceramics and any other malleable material. There were pictures cats in medieval art, and dozens of posters with cute cats and aphorisms: “A solitary cat is like Laurel without Hardy”, and, my favourite, “He won't do the dishes but he'll be there when you need him”. There were keyrings, hats, bags, brooches, badges, materials and so much more all cat-themed. There were cats on cards, cats in cartoons, Felix the Cat and rather too many large scale sculptures of very unhappy looking cats. It was a nutty but overwhelming overkill of cats that even curiosity could kill . . . but also fun. 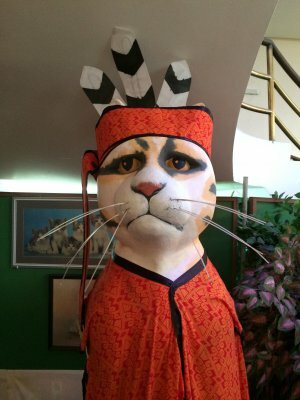 So whether you are a cat person or not – although I doubt dog people would get much out of it, they need to go to St Louis for their fix – I would recommend a visit to the Kuching Cat Museum. It's free and you can take photos on your phone camera if you pony up the equivalent of $1. I might snuggle up on the couch for that one while being relived the numerous cats of Kuching haven't yet mobilised. But, in case he gets any ideas, I'll put Otis outside for a while. There are quite a number of stories about Kuching and Sarawak at Elsewhere starting here.